GBA Mega Man Zero 3 (USA) "100%" in 1:03:53.15 by Rolanmen1. 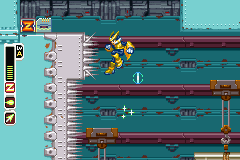 The third game in the Megaman Zero subseries takes place two months after its predecessor. It features mostly the same game play as its predecessors, but with a different Cyber Elf system and customizable armor. Also new are the Secret Disks, which can be analyzed for information about the series, enemies, items, and the characters. Unlike the other run, this run aims to collect all disks, all sub-tanks, and all Ex-Skills. It also gets a special rank when the final stage ends (Disk Capturer) and unlocks Ultimate Mode afterward.